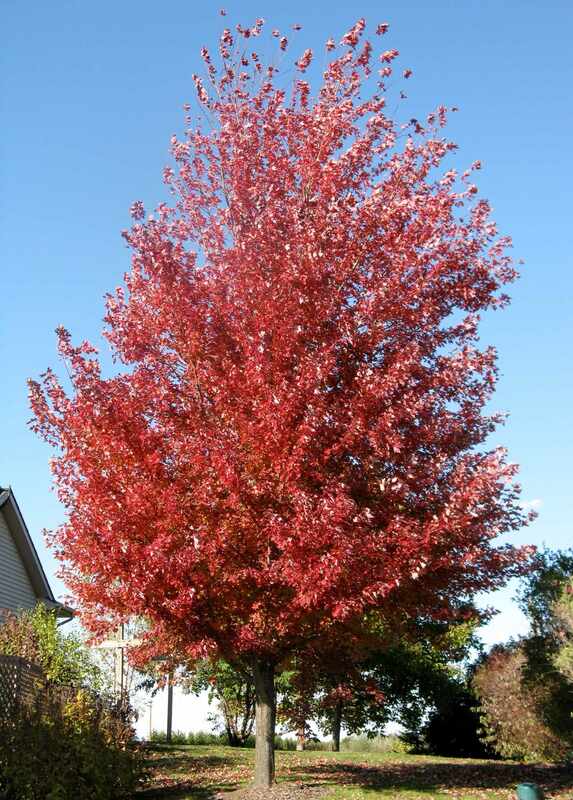 Selected 1997 Tree of the Year by the Iowa Nursery and Landscape Association, Autumn Blaze® is an extremely fast-growing maple with brilliant red fall color. Under good conditions it can grow 3 ft. or more per year. 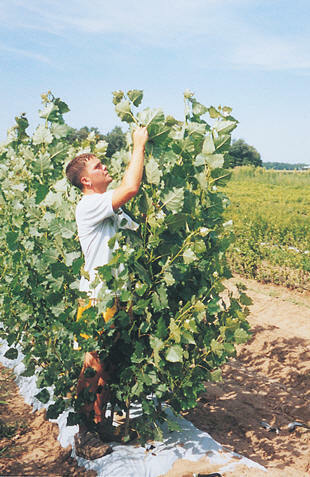 It is tolerant of clay soils and drought and has a dense, oval head with strong branching. Developed in North Central Ohio, Autumn Blaze Maple® will grow in a wide range of climates from Michigan to central Florida. It grows 50 ft. high and 40 ft. wide. Every yard should have one of these trees. This tree with showy white early spring flowers can be grown as a small shade tree or as a multi stemmed tree. Serviceberry has tiny red to dark blue edible berries (See picture for close-up of berries.) Midsummer followed by brilliant orange and red foliage in the Fall. 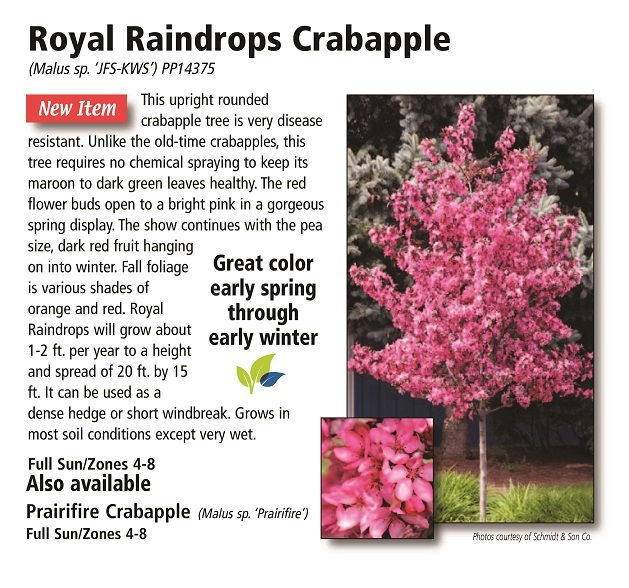 This beautiful small tree will grow to 15 ft. wide and 20 ft. tall in most soil types except for wet or soggy sites. This is a small ornamental deciduous tree with an oval round growth habit. It has a beautiful spring floral display with 1 inch wide by 3-6 inch long clusters of dainty white flowers, followed by 1/3 inch diameter purple fruits. 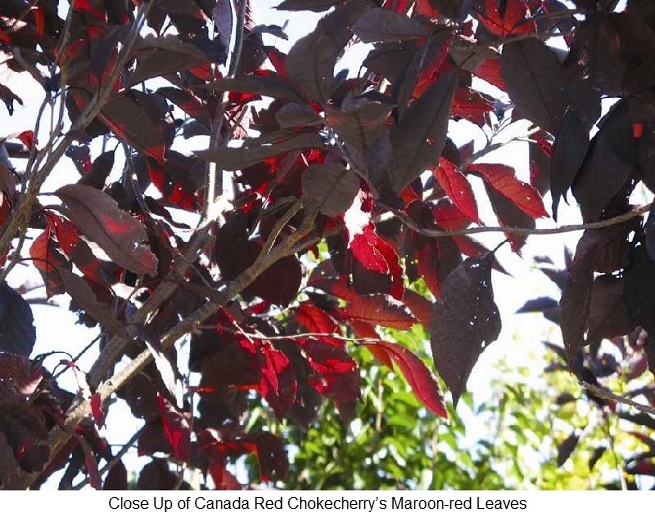 The foliage emerges as bright green turning to a maroon-red early summer and keeps this color through fall. Grows 1-2 ft. per year in full sun to a mature height of 20-30 ft. and 20 ft. wide. Grows best in well-drained soils. 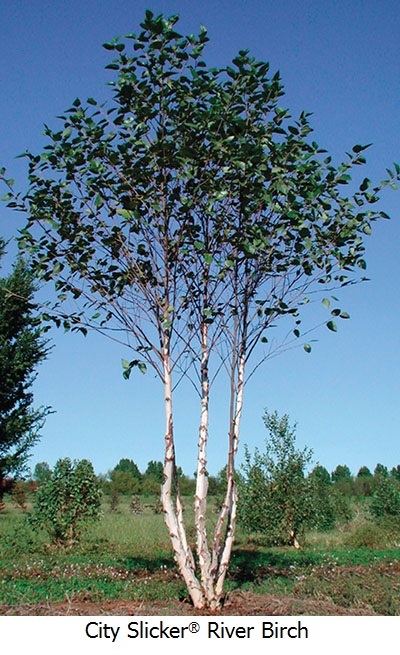 This river birch develops showy white bark when the stems grow to 1 inch and larger, similar to paper white birch. It can grow 2-3 ft. per year with rich dark green leaves that turn butter-gold in the fall. City Slicker® will grow in wet heavy alkaline clay soils as well as sandy soils and tolerates drought better than other river birches. City Slicker® is resistant to birch borers which kill most paper white birch. 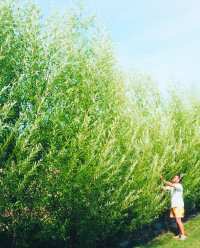 It will grow to 30 ft. tall and 20 ft. wide as a single stem tree or multi stem and requires full sun. Plant 6-8 ft. apart for a unique screen. Developed by Dr. Carl Whitcomb in central Oklahoma. 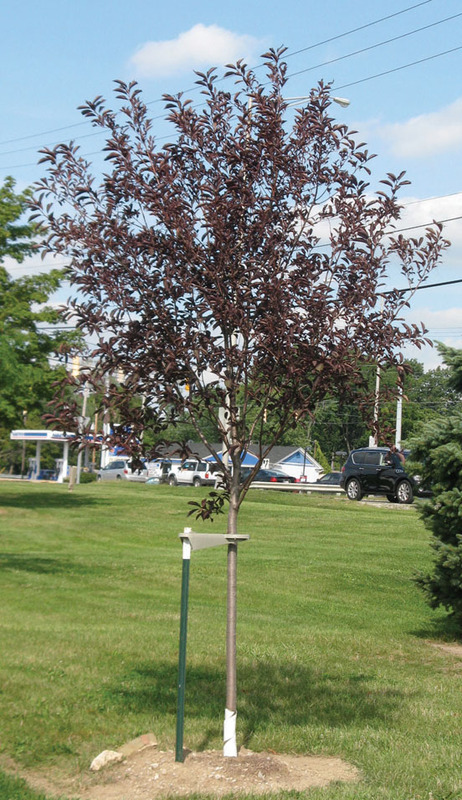 Cleveland Select Pear is an excellent street tree with dense white flowering in early spring and purple fall coloring some years. It has an attractive upright oval form and glossy green leaves. 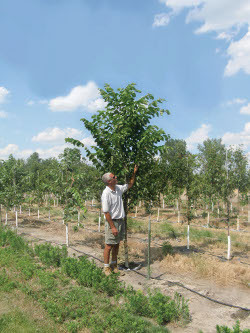 Cleveland Select Pear reaches a height of 30 ft. and width of 15 ft. This pear has a superior branch structure that withstands ice and wind damage better than the Bradford Pear. It is fruitless, has few pest problems, and tolerates urban conditions and heavy clay soils. 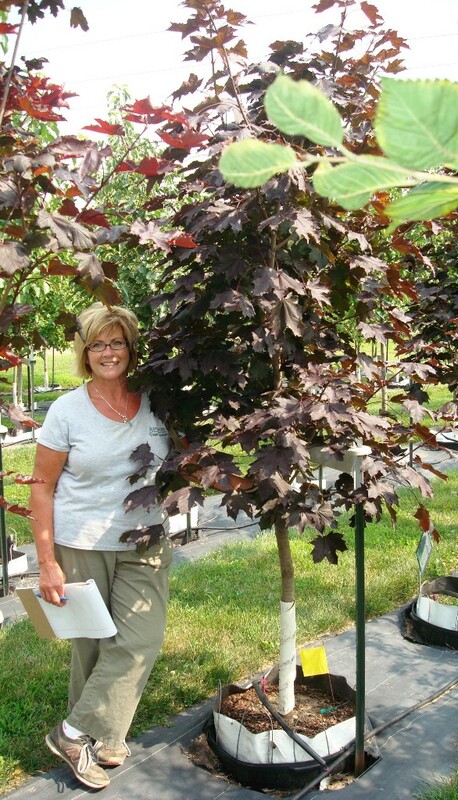 Crimson King Maple is a symmetrical, pyramidal to round crowned shade tree with purple-maroon foilage all season. Slow growing. Grows to 40 ft. tall x 35 ft. wide. 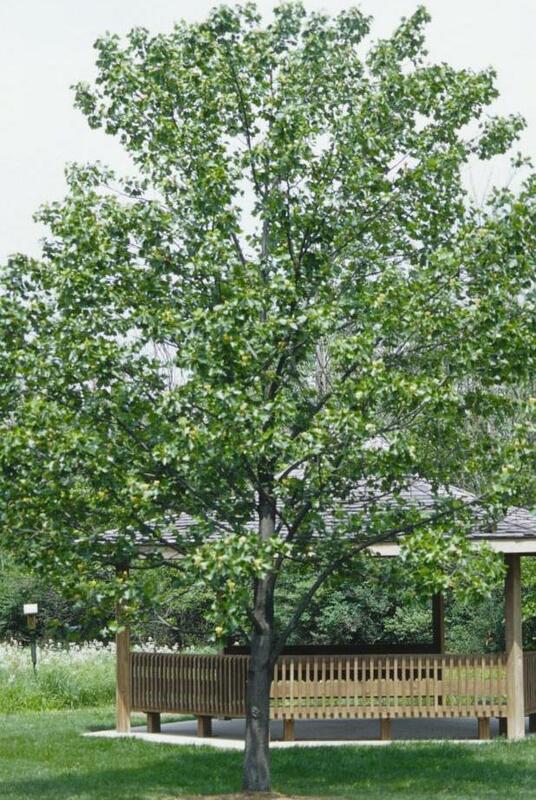 Exclamation!™ London Planetree is a rapid growing, heat and drought tolerant tree that looks similar to a Sycamore. It can grow 5 - 6 feet per year up to 60 feet tall with a 50 foot spread. The large leaves of Exclamation!™ are similar to those of a Sycamore but, unlike the Sycamore, they are resistant to the anthracnose disease. It tolerates a wide range of soil conditions and has patchy cream and tan bark (See picture for detail.). The dark green leaves of summer turn to a yellow-brown in the fall. 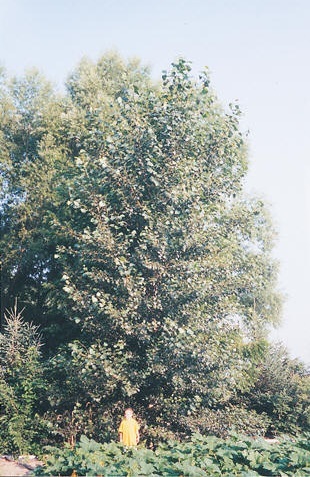 This is a tree form lilac with large plumes of small white flowers in early summer (See picture for close up of flowers.). Blooms after all other spring flowering trees have finished blooming. Ivory Silk Lilac® grows slowly to 20 ft. tall and 15 ft. wide and will fit into smaller spaces. It has dark green leaves emerging early spring that continue into early fall. 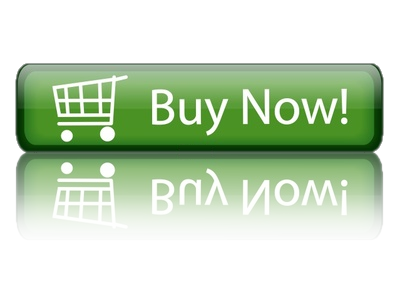 Requires well-drained soil for good growth. 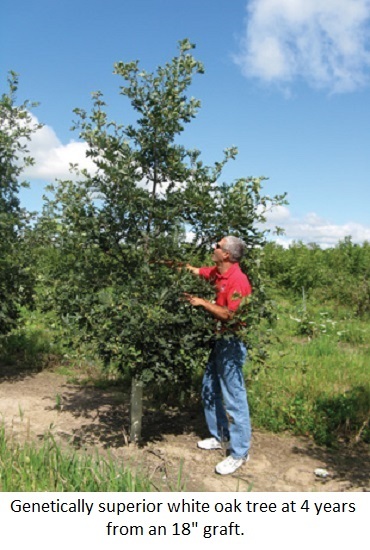 Upright, rounded Prairifire Crabapple is very disease resistant. 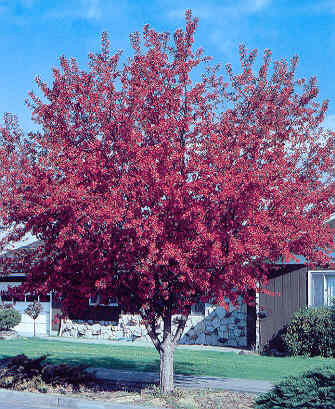 Unlike the old-time crabapples, this tree requires no chemical spraying to keep its maroon to dark green leaves healthy. The red flower buds open to a dark pinkish red in a gorgeous spring display. The show continues with pea size, dark red fruit hanging on into winter. Fall foliage is various shades of yellow, orange and red. Prairifire will grow about 1 ft. per year to a height and spread of 20 ft. by 20 ft. Grows in most soil conditions except very wet. Plant in full sun. 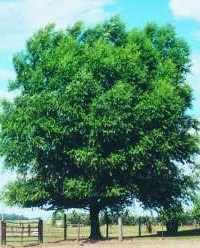 Princeton American Elm is a true American Elm resistant to Dutch elm disease. This extremely fast growing native elm tree will thrive in almost any soil condition. Princeton Elm has a classic vase shape with beautiful yellow fall color and growth rates of 3-6 ft. per year and has been tested and approved by the USDA National Arboretum. 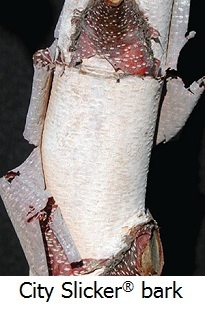 In early years, the fast growth is more narrow and upright compared to Prospector Elm. Princeton spreads out in later years and will grow to 60 ft. tall and 40 ft. wide. It is a long lived—up to 80 years old, fast growing shade tree. Princeton American Elm tree grows best in full sun. Red Oak is one of the fastest growing oaks, with up to 2 ft. of growth per year. It may grow to a height of 60 feet, with a spread of 50 feet. In 15 to 10 years, it may also produce acorns. Its leaves are a lustrous dark green in summer, turn a russet red in the fall and “hang on” very late. 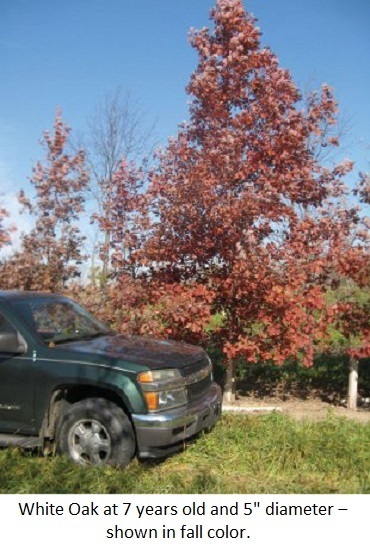 Red oak is tolerant of many urban conditions, but prefers sandy, well-drained soils in full sun. The wood is heavy, strong, and very ice and wind resistant. Supplemental watering, fertilizing and mulching will get this tree off to a fast start. This fast growing, pyramidal shaped tree can grow 3 feet or more per year. Tulip Poplar has yellow, tulip-shaped flowers with orange markings late spring. It will grow to 50 feet tall and 30 feet wide in rich, well drained soils and also in clay soils with adequate drainage or on hillsides. Leaves are glossy on the top side and turn a golden yellow in the fall. Supplemental water during extreme drought will encourage faster growth during these periods. Tulip Poplar is the State Tree of Indiana. Plant in full sun. 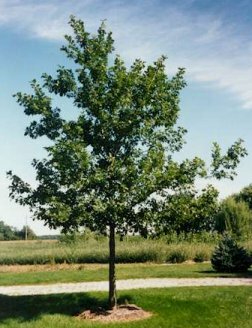 9‑12 ft., #25 container, Superior shade tree - *These are the same Genetically Superior White Oak trees we sell bareroot in large quantities for Investment Timber except they are grown larger and sold in containers more convenient for landscaping purposes.